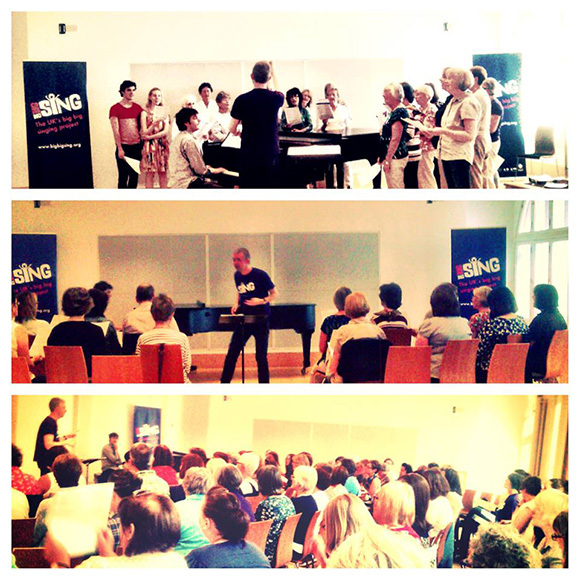 On Sunday 22nd June, my last day in Scotland, I dragged a friend along to a Big Big Sing workshop, if you sing regularly with other people, you will know how it lifts your spirits. It was a great session and everybody there seemed to have a great time. Sadly as I wont be in Glasgow during the Commonwealth games I didn’t audition for the choir 🙁 Can you spot us in the picture ? The concept is such a great idea that I wanted to share it with you. 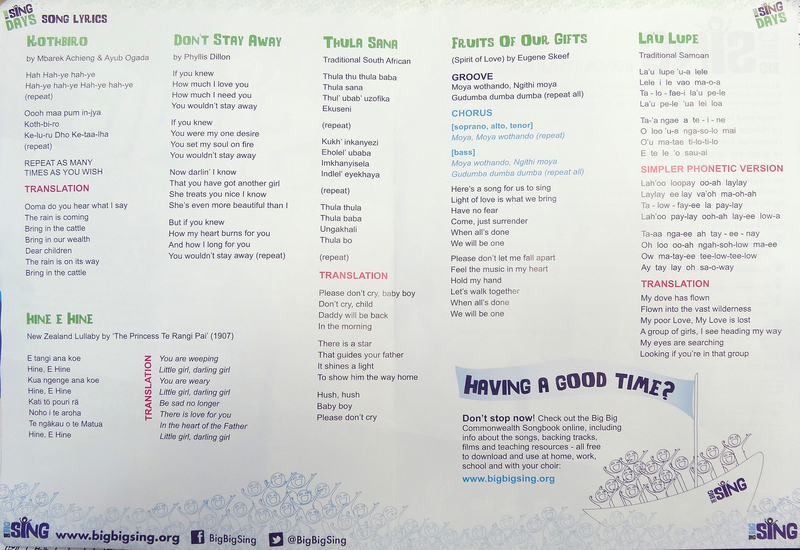 I know that there are similar projects in many different countries and the first time I came across such a scheme was from one of my Australian blog friends who told me all about Sing Australia. I remembered at the time thinking what a great idea so when the chance came along to get involved right here in Glasgow I jumped at the chance. The Big Big Sing in Glasgow on the 27th July, 2014, will bring together thousands of singers for a day of song and celebration. Here are a couple copies of the booklets if you are interested in what we got up to a s a group, just click on the pictures to see a larger image. Later on in the afternoon I went to watch the 10th Scottish International Piano Competition Final. The very first competition was established in 1986 and was won by a teacher at my College called Graeme McNaught. Each of the four finalists played a concerto with the Royal Scottish National Orchestra at the Glasgow Royal Concert Hall. I listened intently, made notes of each performance and how each chosen song made me feel. From this I selected my four placements and went out to tea as I was catching my train home that same evening. I was pleasantly impressed with myself when I got the four finalists in the correct order. My favourite piece was the Brahms played by Jonathan. The international jury chaired by Aaron Shorr included; Dimitri Alexeev, Hyoung-Joon Chang, Ian Fountain, Martino Tirimo, Olga Kern, Steve Osborne, and Wu Ying. In addition to the above there were prizes awarded to each of the ten semi-finalists. Thanks for sharing Charlotte. Are you one the fist picture totaly on the left ? Yes 🙂 we went to the early Sunday morning slot so that we could fit everything in. Not only does it speak much for your musical maturity that you selected those finalists in order, it is also an encouraging reflection on the choosing of order of merit, which some people feel is just a lottery because of subjectivity. The Big Sing sounds wonderful!! We enjoyed it, everyone was very enthusiastic and enjoyed the morning. Anyone could join in trained singers or not. What an amazing concept. I can imagine the smiles bouncing off the walls, never mind the sweet sound of music! As for the piano competition. I love listening to the piano, such a beautiful instrument. Years ago, while inter railing in Eastern Europe, I happened upon a piano competition in a large church. Sneaking in, I sat listening as each note danced in my ears. A treat, a real treat! I loved reading your comment and that was a perfect summation ‘each note danced in my ears’. Brilliant. And yay for the Frenchie winning! I’d love to meet up with you at one Stephanie. I forgot you had a French parent 😉 were you born there too? One thing studying at a Conservatoire has taught me is the diversity of culture from all around the world, it has certainly widened my horizons. I didn’t know singing had all these benefits, I just liked flexing the golden pipes. I’ve done karaoke a few times…see what happens when someone gives me a microphone? 🙂 Imagine if they put me behind the piano. I would test out every note on the keyboard for sure. Happy Thursday. I was in a small choir growing up. My mom was 1st soprano when she was in high school, so she taught us to sing from our diaphragm. We’d go through practice tones and the like. It became tougher for me to sing as I got older because my voice became almost baritone and I didn’t know how to sustain my notes consistently. My focus changed to wanting to write songs, at least melodies, and have someone else sing for me lol. Seems like a different life ago now. I must try the singing when i am gardening. I am so cheered to hear that the prizes for the piano competition included a piano. I know Hilary a fabulous Bluthner Grand pianoforte! Even I might be tempted to practise more on one of those. I sure have missed a lot from going away for a while and being very busy. But glad I caught up and read these two events. They are wonderful indeed, as you said, two great things in one day. You’re exceptional in predicting the first four placements of the Scottish Piano Competition. Maybe one day you’ll be a juror in it. We have an international piano competition too right in our city. It takes place every three years, I’ve sat through quite a few of the previous years’ competitions, and love the finals with the piano concertos. The past winners have been conducting concert tours in Europe as I type. If you’re interested here’s the link. Thanks for stopping by Ripple Effects and reading through the posts so carefully. I’ve always enjoyed reading about your views! Thanks for the link Arti, Pavel’s name keeps popping up all the time recently I read about him in the Telegraph on line I think first. His career must really have taken off, did you see him live? I have added “check out sing Australia” to my ever growing To Do list, thanks for bringing it to my attention! Sounds wonderful to sing in a large group like that. I was in a Sweet Adolines’ Chorus for several months and loved it. I just didn’t love the traveling because it fell at the same time as my yearly vacation in Aruba. I do love to sing. 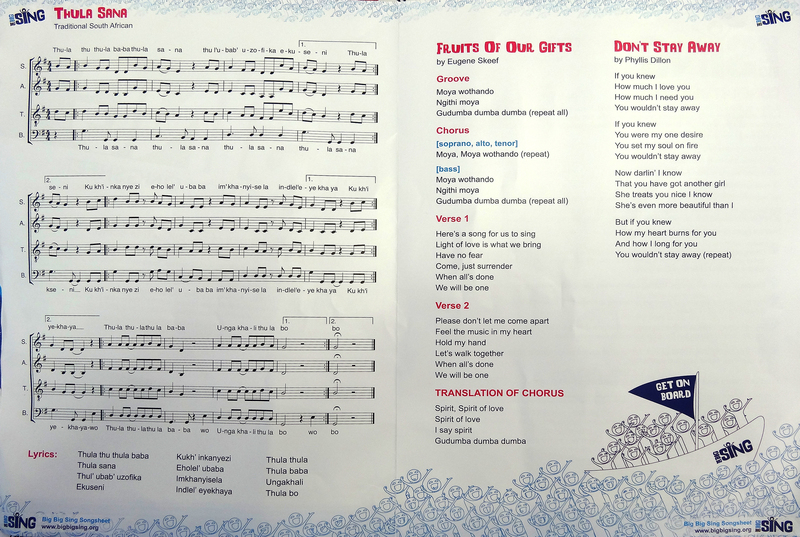 I was a lead in the chorus. 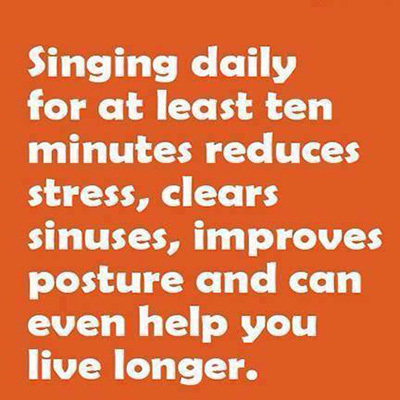 I agree that singing is medicinal to the body and soul. I feel like I am soaring when I sing and when I listen to your CDs. Thank you very much Isabel.